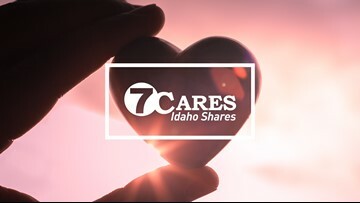 An anonymous donation for $10,000 dollars from a wonderful Caldwell woman who recently lost her dad was given in his memory for 7Cares Idaho Shares! 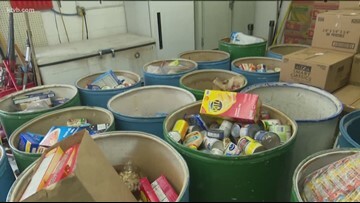 KTVB will be collecting cash and food donations at 38 locations across the Treasure and Magic valleys. Watch live here (bookmark this page!) or on Channel 7. 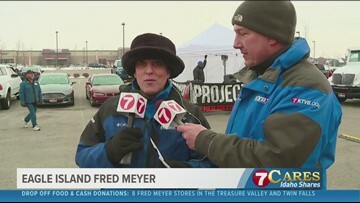 Friends of the Idaho Potato Commission donate 40,000 pounds of potatoes on the annual 7Cares Idaho Shares day of giving and talk about the upcoming Famous Idaho Potato Bowl at Albertsons Stadium. 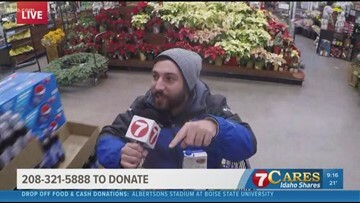 KTVB's Joe Parris and Brian Holmes visit an Albertsons on Eagle Road and demonstrate how to shop for food donations to support several Treasure Valley charities. 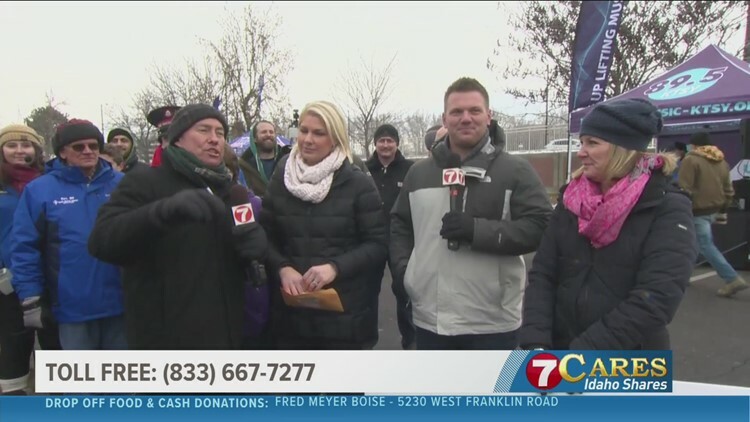 KTVB was collecting cash and food donations at 38 locations on Saturday, Dec. 8 for the annual 7Cares Idaho Shares day of giving. 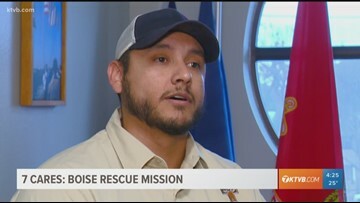 Learn how to donate on KTVB.COM. KTVB will be collecting cash and food donations at 38 locations across the Treasure and Magic valleys. 7Cares Idaho Shares will take place on Saturday, December 8 at 38 locations across the Treasure and Magic valleys. This is an exciting time of year for The Salvation. They provide vital resources for those in need. 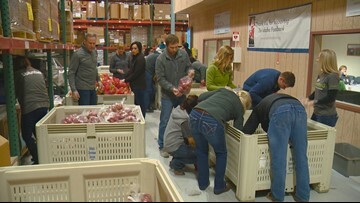 The nonprofit serves over 30,000 people in the Treasure Valley. 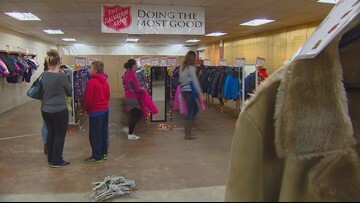 Donations from across Idaho help keep programs at the Boise Rescue Mission up and running for Idahoans in need. 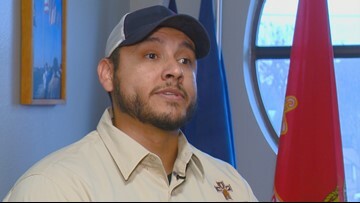 The Veterans Ministry Program helps homeless vets. 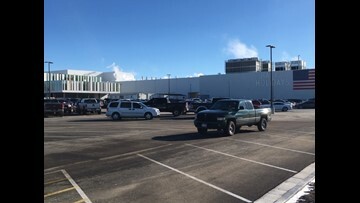 Chobani in Twin Falls is a company that cares. 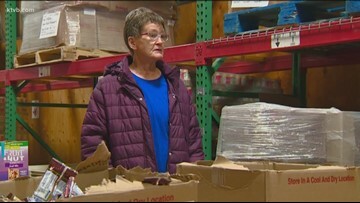 Donations from across Idaho help keep the Idaho Foodbank supplied with essential resources for families in need. See how your generosity make a real difference in people's lives. Generous donations from across Idaho help keep Jubilee House up and running for women in need. 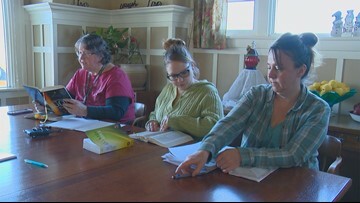 The Jubilee House is a 12-month, faith-based program that helps women struggling with alcohol and drug addiction.